WEBSITE DEVELOPMENT | Advantage Advertising, Inc.
We make web design / development easy & enjoyable so you can focus on building your business. Every good project starts off on the correct foot, website development is no exception….one step after another, until you reach the finish line. On the other hand, starting on the correct foot doesn’t guarantee a swift efficient way of getting to the end….that’s where we come in. We know a straight line is the best, most efficient pathway to your destination, so we make sure to ask all the right questions up front to make sure that line doesn’t get bent out of shape and that your website is designed as quickly and efficiently as possible. Times are changing – mobile browsing exceeds desktop browsing and those numbers are getting further and further apart. 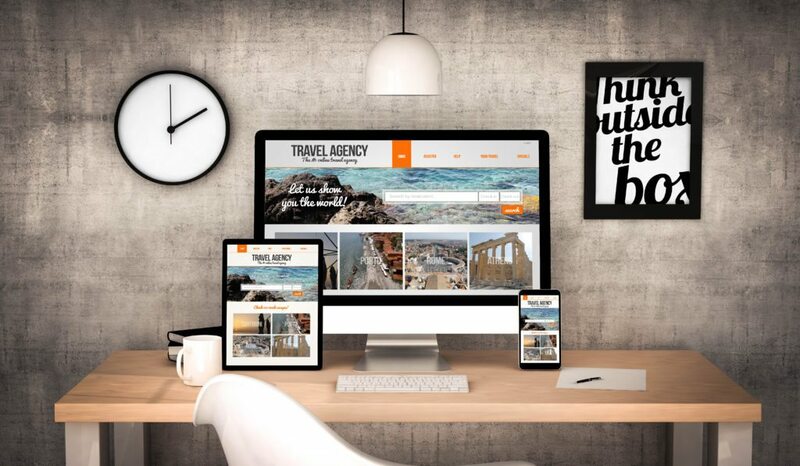 We make sure your website looks great on all platforms – big and small. Responsive design incorporates the needs of the smartphone…the worst case viewing platform, ie. condensed, fast-loading content, so we design for the mobile platform first. We then open the design palette to accommodate the larger viewing platform of the desktop and incorporate more visual content and substance. You don’t have to be an HTML expert or have a degree in coding to make website changes. WordPress allows anyone with a little know-how to make edits to their own website. We create turn-key websites that are edited by the owner or their employees all the time and the nice thing about having us on board is we have your back. If you or someone else breaks the look or functionality of your website, we can rescue your project and help you out. We never go dark after the project. When we create a website for you we know it will take time to get those training wheels off. We guarantee to be there for you from start to finish and we think you’ll find our response times refreshing. Kanyezi Safari is a business relationship that originated through our contacts in Silicon Valley around 2003. Kanyezi Safari, a south African safari group, needed a website and hosting solution that delivered their online content in a consistent and reliable nature. It was costing them thousands of dollars daily when their previous provider could not deliver on their promise of providing a reliable and complete online service. Since 2003, there have been many iterations of the website each adapting and evolving to the newest and latest technologies available. As users have migrated to mobile technology more and more throughout the years, we have also responded with evolving the website and changing it to be faster and more compact. Today KanyeziSafari.org is a website that is responsive to any platform it is viewed on. The response has been huge and customers are very happy as traffic has increased and business is up. Multiple forms, located throughout the website, encourage customers to communicate and find out more information. Colorful graphics and captivating pictures enhance the viewing experience and help future customers envision themselves being on an African safari through Kruger National Park. Our commitment to our customers’ cause has no bounds. We make every effort to provide our clients the highest level of service – even at the sacrifice of sleep. To make sure we keep that proverbial digital net out and ready to capture any safari fish out there, we respond and troubleshoot their website and email 24/7. We communicate with them, even when on safari in the middle of Africa with an 11 hour time difference, all in the spirit of great customer service.